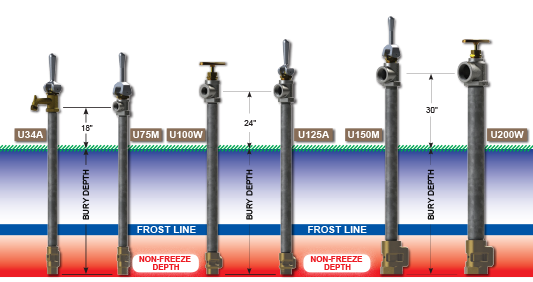 Freezeless, Low Lead, Sanitary Yard Hydrants are designed to produce immediate water flow in sub-zero temperatures. The Thermaline®, Low Lead, Sanitary Water Connector is a compact unit especially designed to provide water service to mobile homes in freezing conditions. The Model H34, Low Lead, Sanitary is a non-draining hydrant that features a thermostatically controlled heating element that prevents water in the hydrant from freezing even at temperatures down to 20 degrees below zero. Utility Hydrants are rugged and dependable, unrestricted and high capacity. Designed for use as auxiliary fire fighting hydrants, filling fire-pond reservoirs, main shut-off hydrant for irrigation systems. These hydrants also connect to 3HP contractor pumps where a permanent outlet is required. Choose from Automatic or Manual close handle or Wheel handle models. Outlet connections from 3/4” NPT - 2” NPT. © Copyright 2014 WCM Industries, Inc.